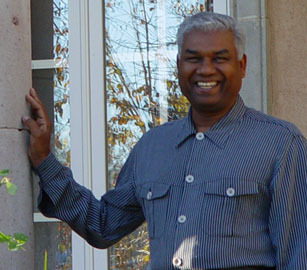 Sam Soleyn serves as a spiritual father to Michael Barrett. Sam and Michael met in the mid 1980's and have been in relationship since the early 1990's. Sam Soleyn was born on the southern Caribbean Island of St. Vincent in 1951. From his early youth he was uncommonly interested in the things of God. At the age of 14 he made a public declaration of faith in Jesus Christ and a year later began to preach the message of the gospel in small villages throughout the island. In 1970, Sam came to the United States and attended college to study for the ministry. He married Lucy in 1976 and they have two children Tamarind and Nicholas. Sam holds a doctorate in Jurisprudence from the University Of New Mexico School Of Law. From 1982 to 1987 he directed the Christian Legal Aid and Referral Service in Albuquerque, New Mexico. This was a ministry that served the legal needs of the poor and helped to unify the Body of Christ. In 1984, in a dramatic encounter with the Lord, Sam was baptized in the Holy Spirit. It was at that time, that God started to unfold the revelation of the Kingdom of God and his calling as an apostle to Him. He began to devote all of his time to the ministry of an apostle from January of 1988 to the present. He has brought the message of the Kingdom of God through radio, television and conferences throughout the United States and has traveled to many foreign countries to speak to the leaders and groups in the Body of Christ. Sam understands that his calling is to bring order to the Body of Christ and to demonstrate the power of Christ in support of the message of the Kingdom. Sam has developed a website, which houses numerous teachings and articles as well as his ministry calendar. From that website, Sam has made available invaluable resources in audio, video and text formats. The materials contained on the site are designed to build the Body of Christ and advance the kingdom of God. Additionally, Sam has published and made available a very timely book entitled, "My Father, My Father." Sam is also currently working on a second book, which should be completed and available in late 2015. You can gain access to all of these materials at: www.soleyn.com.